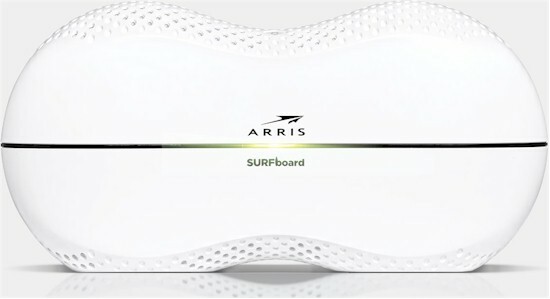 Arris is famous for its broad line of SURFboard cable modems, with models that are modem-only and many with built-in Wi-Fi. The company recently launched a new line of "RipCurrent" SURFboards that include not only built-in Wi-Fi, but also G.hn powerline networking. Our first look at G.hn was with Comtrend's PG-9172 Powerline Adapter about a year ago. Since then G.hn hasn't set the consumer networking world on fire, with no new products from the usual suspects. But Arris is breaking ranks and betting big on G.hn as an alternative to HomePlug AV2 for extending networks via powerline. The RipCurrent line includes AC3200 tri-radio and AC1200 class routers in addition to the AC1900 class SBR-AC1900P I'm reviewing today. There are also companion Ethernet only and Ethernet / Wi-Fi combo RipCurrent adapters to light up those dead zones that most of us have, no matter how big or expensive a router we throw at them. This review will cover only the SBR-AC1900P router; I'll look at how its G.hn features work in a follow-up review. The SBR-AC1900P's dog-bone styling certainly catches your eye but may not be for everyone. It's designed to sit on a table or shelf with its single light bar facing forward. All other LEDs are on the back, presumably where only techies dare to look. Golfball style dimples are liberally spread over the top and bottom edges, but not all are open for ventilation. There are no mounting screw slots. The single WAN and four switched LAN ports are all Gigabit Ethernet and there are USB 2.0 and 3.0 ports for storage and printer sharing. Note each Ethernet port has built-in link and activity LEDs. Because of the built-in G.hn, the power supply is built in and world-wide rated 100 - 240 VAC 50 / 60 Hz. There is also a "Standby" button subtly nestled on the top between the two humps that turns Wi-Fi on and off. While fashion-forward on the outside, the SBR-AC1900P sticks to a tried-and-true AC1900 Broadcom-based design inside. It's hard to see in the exploded view below, but detail photos in the FCC ID internal photos document show six internal printed-circuit dipole antennas. Each set of three single-band antennas has two mounted on the side edges and one on the bottom (!). I can't for the life of me understand that bottom-facing antenna... Heatsinking is generous, though, as you can see in the photo. The SBR-AC1900P isn't the cheapest thing to build, consisting of a main board holding the processor, G.hn and power supply circuitry and a separate PCI-e connected radio board. The label in the photo below shows the board does double duty in the tri-radio SBR-AC3200P. Table 1 compares the SBR-AC1900P with NETGEAR's Broadcom-based AC1900 class R7000 and shows very similar component complements. The Marvell 88LX3142 / 88LX2718 1 Gbps G.hn chipset is the same used in the Comtrend PG-9172. View with top heatsink removed. Radio SoCs and power amplifiers are thermally coupled to the large heatsink. 5 GHz radio is on the right. Note the pads for a second 5 GHz radio for the SBR-AC3200P. Main board lifted out, showing CPU and G.hn components and heatsinking. Note the board marking for the two router models. View of main board top with clearer view of BCM4709A processor SoC and Marvell 88LX3142 1 Gbps G.hn chipset. Main board bottom showing flash memory. Copper foil covers the PCI-e connector for the radio board. Radio board uses BCM4360 for both 2.4 and 5 GHz. This view shows the unloaded second 5 GHz radio pads more clearly.